​Napoli host Lazio in Serie A on Sunday evening, as second plays fourth at the Stadio San Paolo. Both sides return to league action after securing their places in the quarter finals of the Coppa Italia last week. Napoli defeated Sassuolo in Naples, as goals from Arkadiusz Milik and Fabian Ruiz helped the Partenopei to a 2-0 win. Lazio were also victorious last Saturday, as they beat Serie C side Novara 4-1 at the Stadio Olimpico. Goals from Luis Alberto, Ciro Immobile and Sergej Milinkovic-Savic saw the Biancocelesti cruise through to the final eight of the Coppa Italia. Here's 90min's preview of Sunday's huge Serie A clash. ​Napoli will be missing a handful of key players for the visit of Lazio, with a mixture of suspensions and injuries affecting Carlo Ancelotti's squad. Marek Hamsik and Vlad Chiriches both remain sidelined, with the latter out until March. 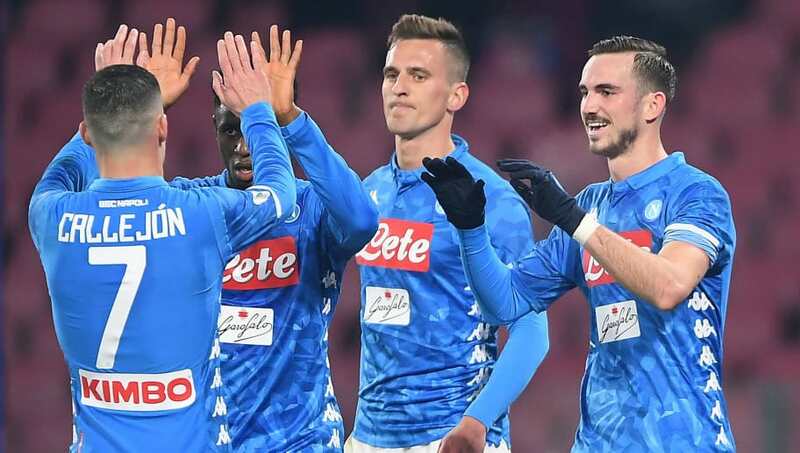 Kalidou Koulibaly, Lorenzo Insigne and Allan are all serving suspensions, with Koulibaly and Insigne missing Sunday's game after both being sent off in the 1-0 defeat to Inter last December. Napoli and Lazio have met 46 times, with the former having the better record. The Partenopei have won 21 times in contrast to Lazio's 15 wins, with the sides having drawn ten times. The two sides last met in August on the opening weekend, as Napoli prevailed 2-1 at the Stadio Olimpico. Immobile gave the hosts the lead, before second half goals from Milik and Insigne secured all three points for Ancelotti in his first game as manager. Napoli are unbeaten in the last seven meetings, with Lazio's last victory coming in May 2015. This fixture is guaranteed goals, as there hasn't been a 0-0 between the two teams in 17 meetings. Both sides started 2019 well, qualifying for the Coppa Italia quarter finals. On Sunday they return to league action, hoping to continue their form from the first half of the season. Napoli have lost just one of their last 12 league games, but still sit nine points off league leaders ​Juventus. On the other hand Lazio have one win in their last nine Serie A games, though five of those have been draws. ​It is certain to be a very tight and competitive match at the Stadio San Paolo, as both sides will be eager to resume their Serie A campaigns in style. Although Napoli are 12 points ahead of Lazio, a win for them on Sunday would still be huge. It's certain not to be a breeze for them, but it looks like the Partenopei will be favourites for this one. Carlo Ancelotti would relish a win this weekend, as he hopes to continue their pursuit of Juve in their aim to win the Scudetto for the first time in 29 years.